NASA’s Mars rover Curiosity has beamed back an incredible image of its surroundings, showing a spectacularly clear view of the enormous mountain that it will clamber up in the next few years. 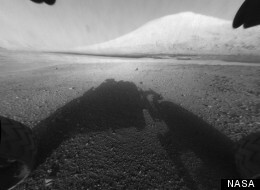 The photo — with one of the rover’s wheels visible in the bottom left corner, the rover’s shadow stretched out in front, and the huge Mount Sharp looming in the background — was released by NASA today (Aug. 6) in a news briefing from the agency’s Jet Propulsion Laboratory in Pasadena, Calif. The photo is a full-resolution image that was taken by one of the rover’s Hazard Avoidance cameras, or Hazcams, said Joy Crisp, MSL deputy scientist at JPL. Mount Sharp is a giant Martian peak that rises 3 miles (5 kilometers) from the center of Gale Crater. The mountain’s many geological layers are particularly intriguing to mission scientists, as they could hold a record of how the Red Planet has changed over time. 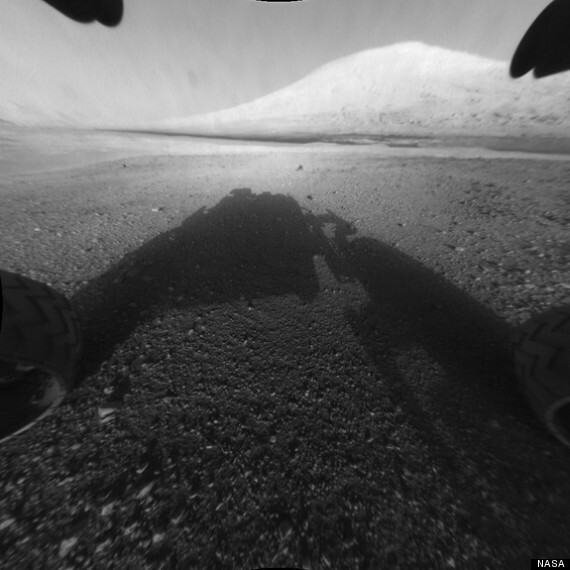 The new photo is also the sharpest view yet seen of Curiosity’s shadow against the Martian surface. A separate Hazcam photo, taken by a camera on the rover’s rear-left side, was also released during today’s news briefing. The photo captures the view behind Curiosity, looking at the horizon and the northwest rim of Gale Crater, which is located approximately 17 miles (28 km) away, Crisp said. These images, from the rover’s Mars Descent Imager (MARDI), provide insight into the rover’s thrilling seven-minute journey through the Martian atmosphere. Early MARDI images show the spacecraft’s heat shield falling away shortly before it touched down on the surface of the Red Planet.